The biceps brachii muscle, commonly known as the biceps, sits between the shoulder and elbow. It has two parts: the long head and short heads. These come together to form the main muscle bulk, which is the “Popeye” part of your upper arm. The biceps brachii muscle runs from the top and front of the shoulder all the way down to the upper forearm. The biceps tendon is the part that attaches the muscle to the bone, both at the shoulder and the elbow. The muscle functions to bend the elbow and turn the hand to face palm-up. The term “tendinopathy” is used to describe injury and pain of a tendon. This is most commonly due to overuse. Biceps tendinitis tends to affect the long head of the biceps more commonly. Both the tendon itself and the tendon sheath can be the source of pain. This condition occurs most commonly due to repeated use of the biceps over a long period of time. People with this condition often present in the later stages of tendon damage, when they begin to experience pain. This means that biceps tendinopathy is a slow-developing condition, without any symptoms until it reaches the point that the tissues become injured and painful. This is the body’s way of self-defence; it is telling you that it doesn’t like the activity you are asking it to do. While specific tasks such as throwing sports, tennis or golf can increase the risk of developing a biceps tendinopathy, often it is simply caused by usual daily activities throughout the course of an adult’s life. With aging comes a decrease in the collagen and elastin components of tendons. This contributes to a reduced ability to sustain a high load, which can cause degeneration or inflammation over a longer period of time. Biceps tendinitis is painful; often aching at night and increasing in intensity when performing overhead tasks such as reaching and lifting. The pain is usually at the front of the shoulder, and can radiate downwards along the front of the arm. People with this condition often have developed adaptations to their usual movement patterns in order to avoid aggravating this pain. This in itself can lead to other issues such as strained or overworked muscles. 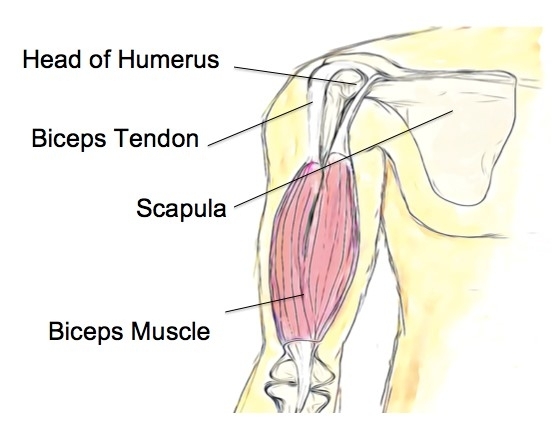 An example of this is hitching up the shoulder to the ear when going to use the affected side, as this will help to offload the affected muscle, allowing the biceps to be under less stress. Unfortunately, eventually this will increase the stress on the muscles of the upper neck and shoulder, leading to secondary aches and pains. Your physiotherapist will assess and diagnose this condition, which will in turn allow for a comprehensive management plan to be put in place. A combination of strengthening, stretching and muscle release is often beneficial to assist in management of this condition. If you have developed secondary complications with changes to your normal movement patterns, your physiotherapist can assist you in addressing these and training your body to avoid causing further damage. If further imaging or onward referral is needed, your physiotherapist can help in guiding you through this process. None of the information in this newsletter is a replacement for proper medical advice. Always see a medical professional for advice on your individual condition.